WoW, that electric aura at the end looks incredibly neat. Ya just gotta love Blizzard for giving it that exact amount of Feral AP. I don't care for theorycrafters who try to put forth any formula for working out the feral AP worth of a weapon i choose to believe that they made this staff 1337 ap for the sheer leetness of it all. Which boss drops this bad boy? I'm definately going to use this over a 1H/OH combo for the sheer awesomeness of it! This staff drops from Hodir(10) in Ulduar. It will most likely be a reward from the "Hard Mode" encounter judging by it's item level. Actually, 226 is the item level of most normal mode heroic boss loot in Ulduar. So this will most likely be a standard drop from Hodir 25, not hard mode. 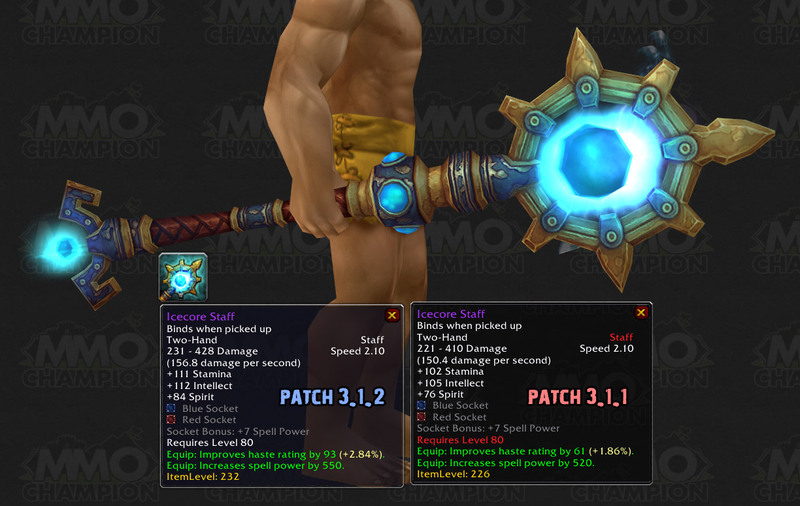 Comparison between patch 3.1.2 Icecore staff and pre patch can be found at http://static.mmo-champion.com/mmoc/images/news/2009/may/ptr_9901_43.jpg now. As of 3.2 the Greater Spellpower enchant now is properly displayed, I have submitted a shot of it. Despite this staff being from WotLK, it matches REALLY well to the normal-mode Dragon Soul Mage Tier.